What are equals(), equalsIgnoreCase() method? All these 2 methods are used for String comparison. Here we need to remember that we cannot compare Strings using == operators. Because == operators are used to compare objects references. equalsIgnoreCase() method compares the Strings irrespective of their cases. From "String in immutable" to "Concepts of String Pool"
String is immutable. Okay… we know it, but what does “immutable” means? Well, immutable means, that once a string is created, it cannot be destroyed, neither can it be modified until JVM is restarted. By now, we can tell that this will assign value “Java Test” in variable a. But, internally that doesn’t quite do so. What it does is, it creates a new string “Java Test”, and point the variable ‘a’ to that memory location. So, now, variable ‘a’ have a value “Java Test”. 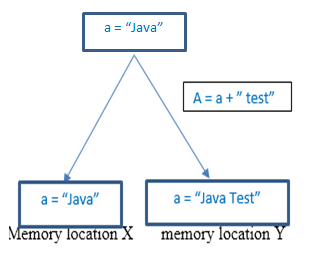 So, internally there are 2 memory locations allocated for string “Java” and “Java Test”. So, it looks like that there’s a lot of memory is wasted if we use String all over our code, right? But, if we look close, certainly there is some facilities of using String. For that we need to know what String pool is. Whenever we are creating a new string using string literal (String a = "Welcome To Java";), it first searches in the String Pool. If that String already exists in there, it uses the reference of the same string in the program. If, it does not exist, it allocates memory for the new string and put it in the String Pool, so that the new variables can use its reference. Again, when we create String objects by using new(), it doesn’t check in String Pool and it creates an object right there. So, it is a better habit to create strings using string literals. When, we are using same String again and again all over the program, it is better idea to use a String. Because, every time, it will not allocate memory location, rather, it will use the same reference again and again. StringBuffer and StringBuilder are classes which provides almost same functionalities as String Class. So, by performance StringBuilder is fastest as it is both not immutable and non-synchronized. When to use String , StringBuffer and StringBuider? When, we are using same String again and again all over the program, it is better idea to use a String. Because, every time, it will not allocate memory location, rather, it will use the same reference again and again. It can produce better performance. If the object is not used by multiple threads it is better to use StringBuilder. If not used by multiple threads, it needs not to be synchronized. If the String is going to be used by multiple threads in the application, then, we need synchronization and StringBuffer is synchronized by default.